The M 60 is a compact and light weight sensor interface unit for analog and digital sensors. Up to eight M 60 can be used to expand the number of input channels of the data logger C 60 as well as the display DDU 9. The M 60 are linked via high-speed Ethernet interface. This allows for synchronized acquisition of data from the different units and the ECU. The M 60 offers 26 analog inputs, four rotational inputs, four pwm outputs and two independent CAN buses. Each analog input channel features an analog pre-filter, 8 x oversampling and highly linear digital filtering. The cut-off frequency of the digital filter is automatically adjusted to match the acquisition rate. The latency of the digital filters is corrected during recording, yielding zero filter delay in the recorded data. The evaluation of each M 60 measurement channel is individually configurable with the PC configuration tool RaceCon. Charge accumulator for > 6 h after installation. Charge accumulator twice per year for > 6 h.
Send device to Bosch dealer for accumulator change. 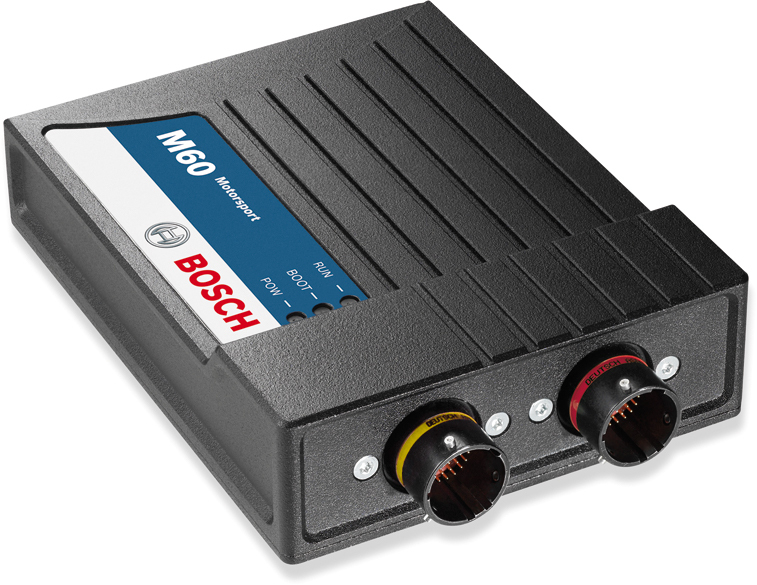 The required software (.pst file) for this device is available in the download area of our homepage www.bosch-motorsport.com.